Typus orbis terrarum III tapestry shows a gorgeous antique world map in blues and browns. Here we see the Mappenmonde or World map based on the 17th and 18th century cartographer's works where art and science were equally important and represented in world map creations. The world outlines are seen and are remarkably accurate for its time, and in this version, we see a lovely balance of browns, greens, and blues which shows off the contours beautifully. Through naval explorations and scientific calculations of cartographers, the positions of landmarks and country outlines were determined and in world maps is combined to crete a visual feast. 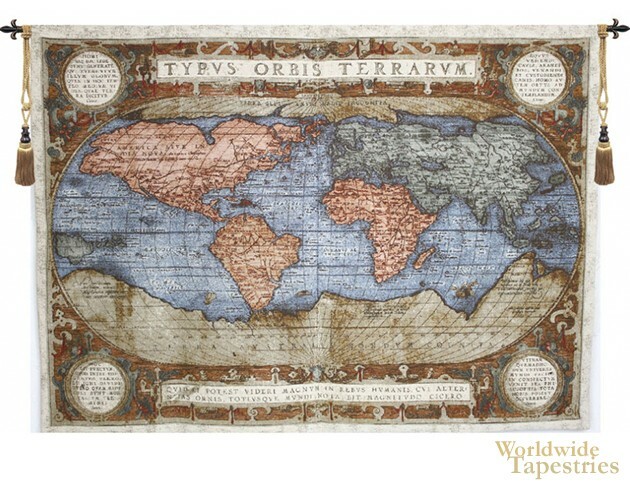 Typus Orbis Terrarum III world map tapestry is backed with lining and has a tunnel for easy hanging. Note: tapestry rod and tassels, where pictured, are purchased separately.